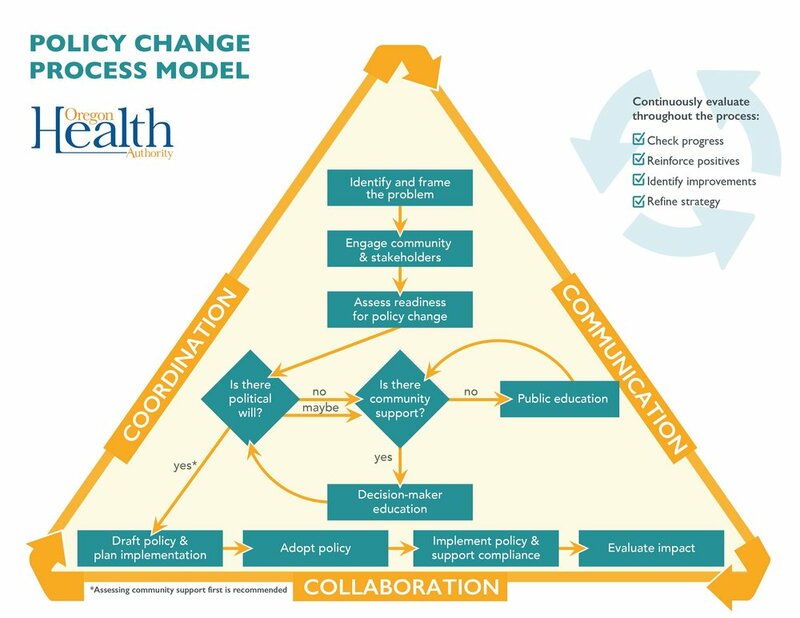 Over the past couple of years, Rede Group has been working with local public health program staff across Oregon on a policy change process model. We worked with a small group of 8 where we were able to bounce ideas and listen to their thoughts while at the same time asking the larger field for their input. We asked over 100 open-ended questions and had several hundred pages of data to help us create this model and then share insights and tools we gathered while going through the process. We believe the tools and the process will help future practitioners pass great policies in Oregon and beyond! The model has become a great platform for training and technical assistance. Please contact us if you would like to talk about how we can work with your organization or conference to create a fantastic, personalized learning experience. Below you can see the graphic and white board depictions of the Policy Change Process Model. A special thanks to all of those who helped develop this with us! My name is Hannah Zyirek and I am a Public Health student at Oregon State University. I have been interning with Rede Group for three weeks now and have already gained new skills working with qualitative data and health policy. In this blog post, I will briefly talk about what projects I have been working on and describe my experience thus far. During the past couple weeks I have been analyzing qualitative data, which I will continue doing throughout the duration of my internship. This includes coding partner interviews for an evaluation of the Oregon Public Health Division’s Healthy Communities Program. This project has taught me how valuable qualitative data can be when evaluating community programs, policies, and more. I’ve also been de-identifying interview transcripts from focus groups led by Rede Group. Focus groups serve as a helpful way to receive feedback on the impact of public health changes. Lastly, I recently started a new project working with tobacco free worksite policies. I have always had an interest in tobacco prevention and control, so it’s really interesting for me to see how tobacco free policies compare to the standard set by Rede Group. In addition to learning new skills, I’ve really enjoyed seeing how a consulting firm operates. I have had an interest in health consulting for about two years so this has been a great opportunity to witness their day-to-day activities. Often times I hear stories from other Public Health students about not getting to take on a lot of responsibility during their internship, but Rede Group has provided valuable learning opportunities for me so far. All of the projects I’m working on contribute toward the work Rede Group does for their clients. I have also really enjoyed my work dynamic. Most of my time is spent working independently, so I am able to manage my time accordingly. My favorite part about interning at Rede Group is the environment. Not only is the team fun to be around, but we also have an office dog named Gus; he always greets me at the door and says hi to me every once in a while at my desk. I love being around dogs so this has made my experience even better. I’m looking forward to seeing what’s in store for me during the next seven weeks of my internship. Be sure to keep an eye out for my next blog post! The staff here at Rede Group often find themselves in really unique places around the Northwest and the United States. As we visit cool places we are going to share some of the things we see and experience with you! This week a couple of us had a chance to visit Raleigh/Durham, North Carolina. We met with a fantastic group of public health professionals and helped facilitate them through a strategic communication plan. We had a blast! While visiting we toured the Duke Homestead (where the Duke family pretty much started the tobacco industry in the US.) They celebrate without much mention of the death and devastation that originated there. 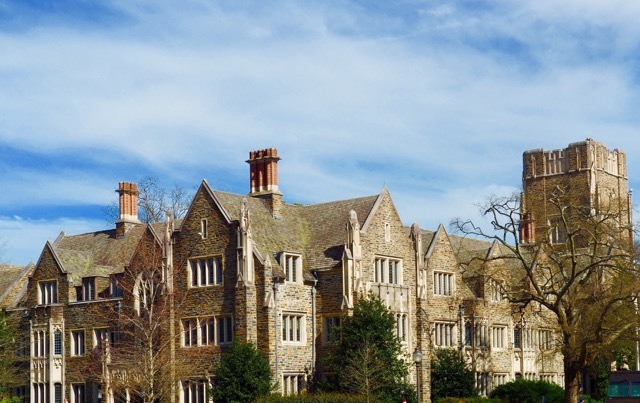 Next we visited Duke University. Originally Trinity University until the tobacco/energy family endowed enough money to change the name. Welcome to the Rede Group Intern blog entry. Here you will find posts from our interns about what it is like to be an intern at Rede, the projects they are working on, knowledge and skills they have developed and more. We really value our interns and want to share their experiences. My name is Alex McFerrin and I am a Public Health student at Oregon State University. I have been interning at Rede Group for the past nine weeks and have had a great experience. In this blog post I will tell you a little about what I have done and learned throughout my internship. During my internship I have gotten to learn about and contribute to many different projects that Rede Group is involved in. Today I want to talk about the project that I spent the majority of my internship focused on and was given the most responsibility on. The project is an evaluation of the Oregon Public Health Division’s Healthy Communities Program. In this evaluation I have been responsible for creating, administering, and analyzing a survey for the eight counties and one tribe that participated in the Healthy Communities Program. Another aspect of the evaluation was to develop an interview guide and conduct interviews with the nine Healthy Communities Program Coordinators and some of their partners. I am currently in the process of completing the interviews and beginning analysis. My next step in the evaluation is to perform preliminary quantitative and qualitative analysis on the data we have collected and present it at a meeting with the Oregon Public Health Division and user panel. Rede Group provides a great balance of group collaboration and the expectation to complete work individually. My supervisors have given me enough guidance to feel confident in my abilities and ample responsibility to gain meaningful experience that can be applied after I graduate. Welcome to our new Blog here at the Rede Group. This is a place where you will be able to see some of the new and exciting things we are up to, take a look at photos of some of the cool places and communities where we get to work, and even take in a few videos featuring some of the great folks we work with. You will also get the occasional OP ED from us on issues we are passionate about. As another new feature we will also be giving our interns an opportunity to share their perspective on current issues and events. We are really looking forward to sharing what we do with you! What’s New at the Rede Group you ask? We are very excited about several new projects we are just beginning. I would like to tell you about a couple of them in this edition of our blog. If you are not aware, Rede Group does a lot of work with local and state health departments working toward the Public Health Accreditation Board accreditation. We really enjoy helping health departments work their way through the process. 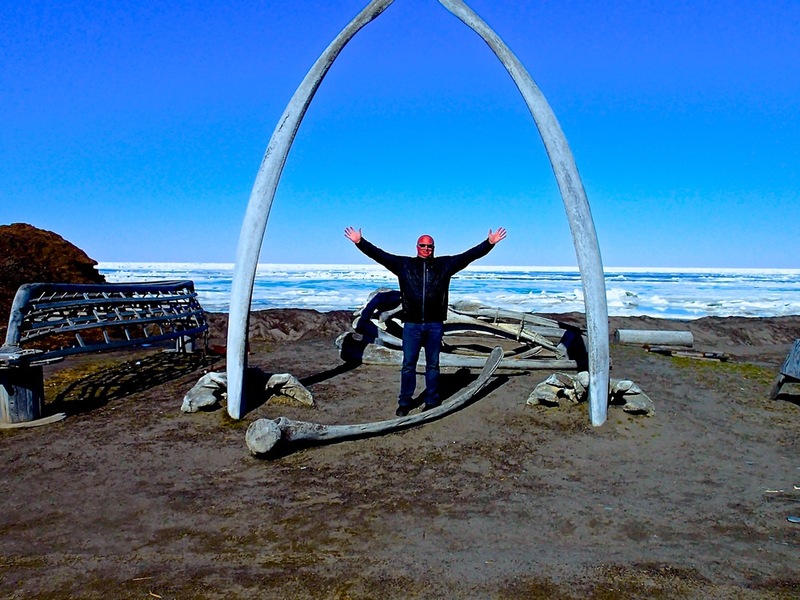 We recently began working with the North Slope Borough (in Alaska) to get them started on their path to public health accreditation., For those of you who may not know this, the North Slope Borough is as far north as it gets in the US, and for that matter, the world. The northern side of the Borough along with its largest city, Barrow, sits on the Arctic Ocean. Rede Group has worked in Barrow on a few projects and we are really looking forward to going back again. I have included a couple of photos here from one of our trips. We are really looking forward to sharing more with you when we make our next journey to the far north of Alaska. We’re also thrilled to be working on a project for the State of Oregon, OHA to help the six Regional Health Equity Coalitions (RHECs) tell their stories. These are very important groups throughout the state and we feel honored to be working with them to help share their mission and accomplishments. We will be traveling all over Oregon over the next few months listening, learning and helping to create some new ways for these groups to tell their stories. Strategic communication is one of the areas Rede Group is helping communities and organizations realize their goals. We are looking forward to helping the RHECs reach theirs. One last project I will tell you about today is taking Jill and myself across the country. We are headed to North Carolina to help their state tobacco coalition with an “emergency” strategic communications plan. This smart group of people understands that when you’re working with policy and partners you need to have a plan in place for when things start taking off in the wrong direction. Maybe somebody decides to defund your program. Or, your smokefree workplace law is under attack. Acting quickly and efficiently can make all the difference – especially when each member of a coalition has a unique role. We will be facilitating them through the process so that they are well prepared for any issues that may come up. We will be posting photos here from our trip when it happens in early March. Thanks for reading the first installment of our new blog. We hope to see you here often!